Rancor Over Mosque Could Fuel Islamic Extremists The debate over the proposed Islamic center has attracted the attention of young Muslims who drift in and out of jihadi chat rooms and frequent radical Islamic websites. 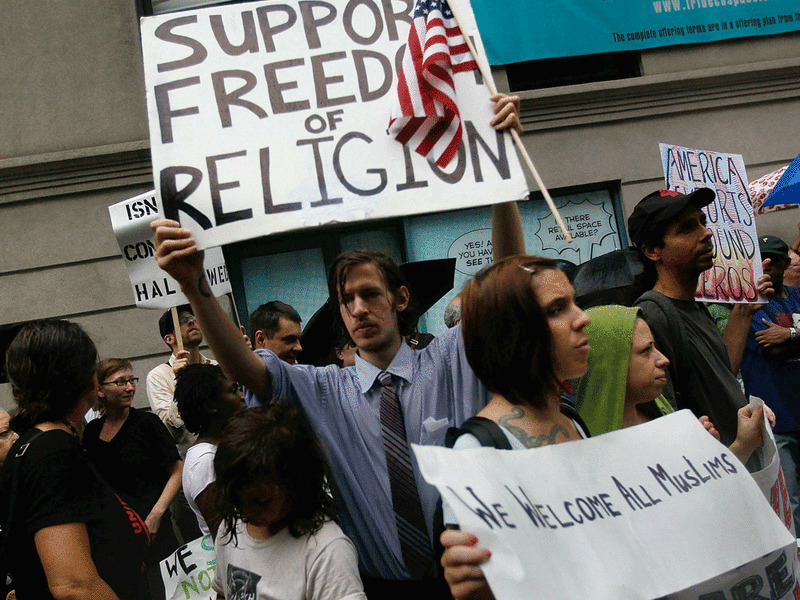 According to some of the posted messages, it is proof positive America is at war with Islam. 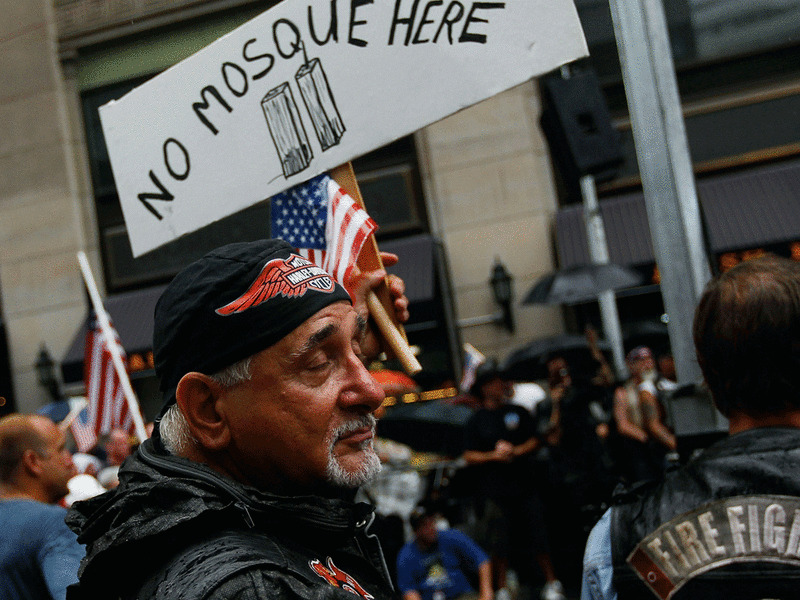 An opponent of an Islamic cultural center and mosque planned near ground zero in Lower Manhattan holds a sign during a demonstration Sunday in New York. Activists both for and against the proposed Park51 project rallied supporters near the proposed building site. Experts worry the controversy surrounding an Islamic center near ground zero in Lower Manhattan is playing right into the hands of radical extremists. The supercharged debate over the proposed center has attracted the attention of a quiet, underground audience — young Muslims who drift in and out of jihadi chat rooms and frequent radical Islamic sites on the Web. It has become the No. 1 topic of discussion in recent days and proof positive, according to some of the posted messages, that America is indeed at war with Islam. "This, unfortunately, is playing right into their hands," said Evan F. Kohlmann, who tracks these kinds of websites and chat rooms for Flashpoint Global partners, a New York-based security firm. "Extremists are encouraging all this, with glee. "It is their sense that by doing this that Americans are going to alienate American Muslims to the point where even relatively moderate Muslims are going to be pushed into joining extremist movements like al-Qaida. They couldn't be happier." As originally conceived, the idea behind the Islamic Center in downtown Manhattan seemed simple enough. The brainchild of Imam Feisal Abdul Rauf and his wife, Daisy Khan, the building was supposed to be like a YMCA — only it would be Muslim, not Christian, and it would contain a small mosque. It would be a small office tower, not a building with minarets, about two blocks from where the World Trade Center towers once stood. "There will be a 500-seat auditorium; there will be a swimming pool; there will be athletic facilities; there will be cooking classes," Daisy Khan told ABC's This Week on Sunday. "There would be education forums, conferences and basically it would become a place where ideas can be exchanged but tolerance, mutual respect can be extended." While Khan was explaining her vision on a Sunday talk show in Washington, foes and supporters of the center were lined up just outside 51 Park, where the center is supposed to go up, hurling insults at each other — both verbally and visually. "USA, USA, USA," one group began. "No clubhouse for terrorists," taunted one sign. "When did it become OK to be a bigot and a racist again?" shouted another. The police did their best to keep the two sides on opposite sides of the street. Supporters of the center chant slogans and carry signs during the Sunday demonstration. While that's how the debate has played out publicly for weeks -– pundits and politicians on the news shows and protesters on the sidewalks — out in the blogosphere, in password-protected radical web forums, there has been an altogether different view. All this controversy and vitriol are not only encouraged; they're welcomed. Extremists and radical clerics posted a stream of "I told you so" messages: After years of telling followers that Islam was under attack by the West, the harsh reaction to a simple community center seemed to prove it. That message, transmitted in a multitude of chat rooms and websites, has law enforcement worried. There have been a record number of homegrown terrorist plots in this country since late last year, and the conventional wisdom has been that the long wars in Iraq and Afghanistan have moved some young Muslims — many of whom came of age watching U.S. forces fighting in two wars on television — to join the fight. This year alone, the FBI has intercepted nearly a dozen young American Muslims who allegedly were on their way to terrorist training camps in Pakistan or Somalia. They have come in all shapes and sizes and ages. But in nearly every case, the young men said America's so-called war on Islam was one of their big reasons for deciding to leave. The Bush administration mantra had been that the U.S. was at war with al-Qaida, not Islam. And the Obama administration has echoed that call; but somehow that has been muffled in the current debate. Intelligence officials tell NPR that what has struck them about the young Muslims they have intercepted this year is that every last one of them has claimed to be inspired by one man in particular: an Internet cleric named Anwar al-Awlaki. He's the American-born radical imam who has been linked to the Fort Hood shootings and the failed attempt to blow up a Detroit-bound airliner on Christmas Day. Awlaki is thought to be hiding out in southern Yemen as a member of al-Qaida's arm there, and U.S. intelligence believes he has moved out of his role as the group's propagandist into a more operational job. That doesn't mean his words have lost their punch. They have been immortalized on the Internet. In some cases, the young men who have decided to leave the U.S. for terrorist camps abroad told investigators that they merely followed Awlaki's lectures. In other cases, Awlaki allegedly actually corresponded with them, exchanging e-mails and extending invitations to come to Yemen. Earlier this summer, Awlaki made clear he was drawing a bead on disaffected American Muslims in particular. He released a 12-minute video that included, among other things, a direct appeal to them. "To the Muslims in America, I have this to say: How can your conscience allow you to live in peaceful co-existence with the nation that is responsible for the tyranny and crimes committed against your own brothers and sisters?" he began. "How can you have your loyalty to a government that is leading the war against Islam and Muslims?" It is this last bit, about loyalty to a government leading the war against Islam, that finds some traction in the current debate over the Lower Manhattan mosque, says Brian Fishman, a counterterrorism research fellow at the New America Foundation. He's been tracking Awlaki for years and is concerned that the latest controversy over the Islamic center will end up making Awlaki look prescient. "Over the past nine to 12 months, Anwar al-Awlaki has tried to promote this notion that the West, and particularly the United States, will turn on its Muslim citizens," Fishman said. "And some of the anti-Islamic tone that has been going around the country in connection with the mosque debate feeds into this notion that people like Anwar al-Awlaki can take advantage of." Given the highly charged environment, that notion is unlikely to change anytime soon.